There is no place on earth like Savannah. It is, by far, my favorite city that I’ve ever visited. 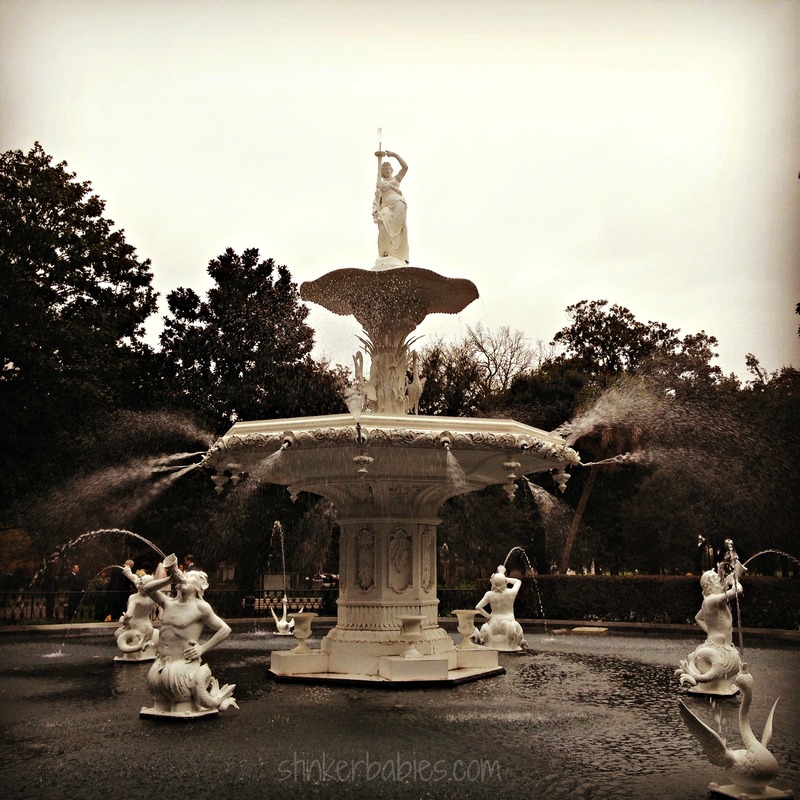 Full of grace and charm, quirky characters, and tons of history, this place has it all. I’ve been three times during the last 12 years and there are still things on my list to do! Most recently, Jake and I were able to go and celebrate, ummm, either our 10th wedding anniversary 10 months late, our 11th anniversary two months early, or my birthday. I’m going with all of the above! 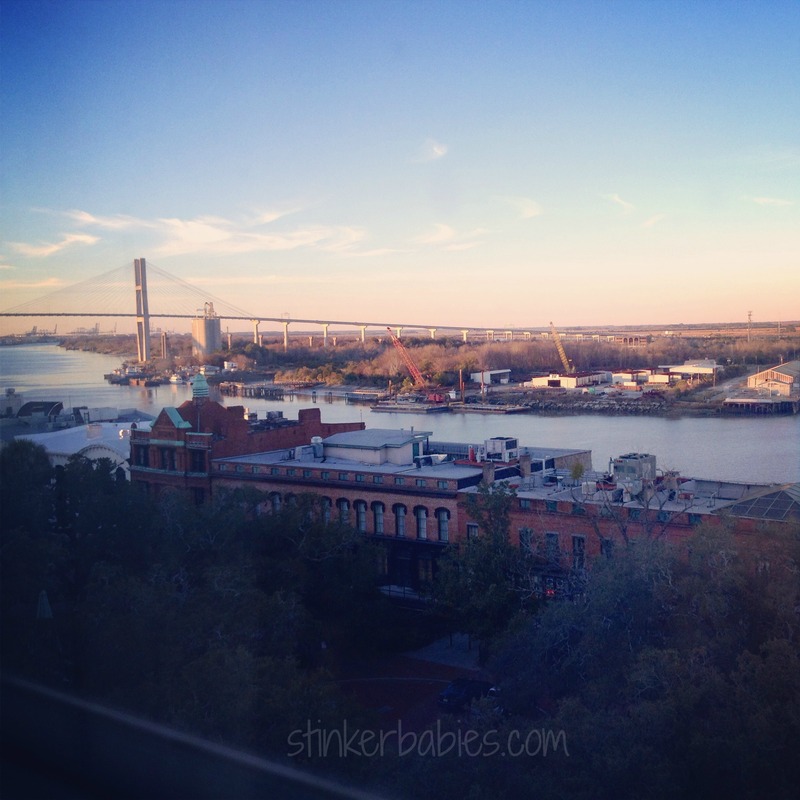 I wanted to share some of our adventures, tips, and tricks with you so you can fall in love with Savannah, too! This was the first choice we needed to make. There are so many excellent hotels in the Savannah area. The first thing we needed to be sure of was that we were staying in the historic district. We wanted to be able to walk downstairs and be in the middle of it all. After pricing out several options and mapping them out, we went with the Holiday Inn Express Historic District. This was the absolute best choice for us and we will most likely stay there every time we visit Savannah. The rates were extremely comparable to other hotels in the area and even cheaper than most. Located on East Bay Street, you are within walking distance to just about everything you want to do and see. The hotel is beautiful, clean, and the room was plenty roomy enough for the two of us. It included a mini fridge and a microwave which was really convenient for any of those amazing Southern cuisine leftovers. As if you wouldn’t eat it all the first time. The continental breakfast had plenty of choices, including hot eggs, sausage, bacon, and biscuits. Reserve, request, beg, whatever you need to do to get a River View Room. These are located on the higher floors and are removed from the street noise. The views are absolutely incredible. 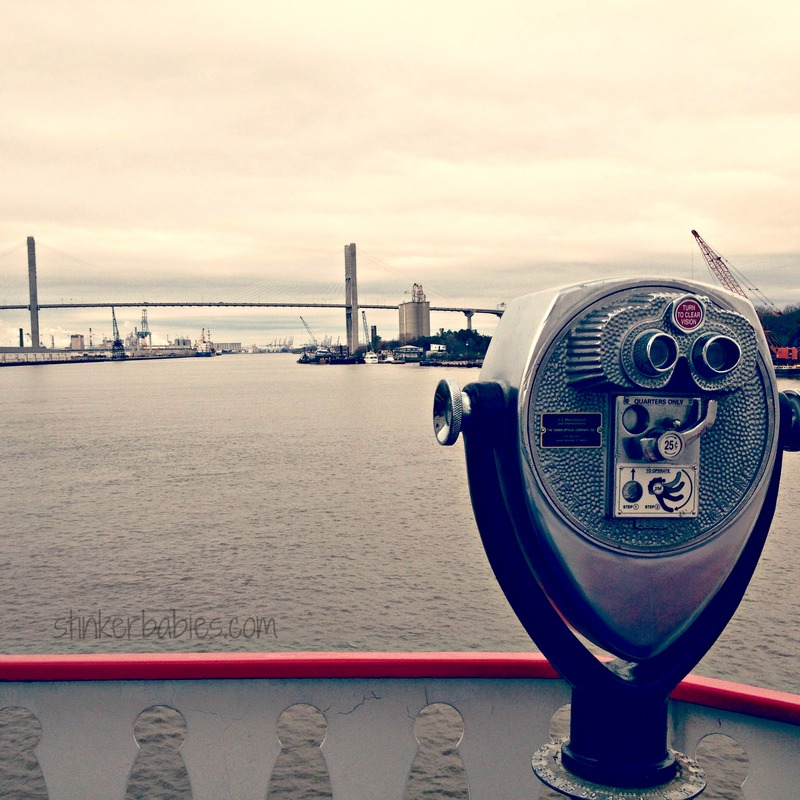 We were able to see the Talmadge Bridge and all kinds of boats and ships traveling up and down the Savannah River. Just gorgeous! To avoid the pricey parking rate (which every hotel has), park just next door in the public parking garage. It is literally just next to the hotel valet and we paid half the price! Take advantage of the rooftop pool and spa. But don’t wait too late. We went in January and forgot our swimsuits. We still wanted to check out the views, but we waited too late and the pool was closed for the evening. This means the door to the roof is locked up tight, so no stargazing after hours. Connect with your hotel on social media before your stay. I found our hotel on Facebook (click here for Holiday Inn Express Savannah Historic District) and made a point to write on their wall. I wrote something like, “Hi! My husband and I will be celebrating our anniversary with you next weekend and we were wondering what we should be sure to do while staying in Savannah!” They not only responded with great suggestions, but they noted in the reservation system that we were celebrating our anniversary. When we checked in, they had a free bottle of wine waiting for us. The customer service was excellent! This was also a great way to keep up with what was happening around town during our stay. For example, down by the riverfront, they have fireworks to celebrate the First Friday every month. Fun! One of the most popular things to do on a Savannah getaway is to join up with a Ghost Tour. No matter how you feel about the supernatural, these tours are always a favorite way to learn more about the local history, the legends, and the cultural stories. Known as one of the most spirited cities in the country, in more ways than one, there are tons of different tour companies offering to share Savannah’s secrets. Having done a couple of walking tours in the past, we decided to switch it up this time. We decided on a Pub Tour with Tara Haunted Tours. Voted Best Savannah Ghost Tour by Southern Living for 2011 and 2013, we were not disappointed. Our guide, Chad, was very knowledgable about Savannah’s history, architecture, and folklore. Tours run about 2 hours and are scheduled nightly. Reservations are required, so book online before you go! Schedule your pub tour for your first night. This way, you’ll get a great overview of places you’ll want to check out before leaving town. After our tour was over, we headed back to one of the stops (Zunzi’s) to have dessert (the brownies are homemade and to die for) and listen to some amazing live music. Get to your meeting location early. We met at McDonough’s Irish Pub to depart with our group. Jake and I walked down an hour early and had a delicious dinner while waiting for our group. If you go, order this Southern twist on a classic: the Bacon, Lettuce, and Fried Green Tomato. YUM! Bring your camera and ask questions! Your guide will have tons of stories and knowledge about Savannah. They love sharing their wisdom with you. Most guides have day jobs and truly just enjoy sharing their city with visitors. Chat with the other folks on the tour. You never know who you’ll meet! Most of all, relax and enjoy! One of the easiest ways to see Savannah is on a Trolley Tour. Yes, you’ll walk around town with a brightly colored sticker on your shirt and people will immediately know you’re a tourist. But it’s okay here. Savannah loves her guests! Sometimes that sticker will get you a discount or two, as well! A higher price does not mean a better tour. We decided to go with Oglethorpe Tours. They’ve won several awards and have been featured on the Travel Channel and CNN Travel, but they are also the cheapest tour in town. Take advantage of the On-Off Option. With Oglethorpe Tours, they came and picked us up at our hotel and drove us to the ticket office to board the trolley. We then enjoyed a very educational and entertaining 90-minute tour of the historic district. Our guide was hilarious. A Savannah native, she will tell you honestly what to avoid and what not to miss. After the main tour, you can use Oglethorpe Tours like your own personal taxi service. They have at least a dozen designated stops around town and are just a phone call away. This is fantastic for those places you want to visit that are a just a bit further than you have time to walk. Double up! Most tour companies offer a variety of package options. You can pair your trolley tour with tons of other choices: ghost tours, riverboat tours, historic home or museum tours. If you already know you’d like to see some of these, you’ll end up saving money by getting the package! Thanks to a very thoughtful Christmas gift, we had the opportunity to see Savannah from a new perspective! We boarded the Savannah River Queen for a one hour sightseeing excursion up and down the Savannah River. It was a great opportunity to grab some photos! They offer all kinds of cruises, including dinner, lunch, gospel, and murder mystery! Book online and save a few dollars with the online discount! If you’d like to see Savannah from the river but don’t want to spend the money on a riverboat cruise, try taking one of the Savannah Belles Ferries! They’re FREE. With a few landing sites, you can hop a ferry and cross the river to the convention center or the Westin Resort and Spa. Walk around, grab some photos, and hop the ferry back over to the action! Oh the Places You’ll Go! could have been Dr. Suess’ ode to Savannah restaurants. There are so many great choices and you’ve probably already heard of many of them. We had another Christmas gift that allowed us to have a fancy dinner to celebrate our anniversary. We wanted to do this on Saturday night so we’d have time to pretty up a bit. We walked just around the corner from our hotel to what just might be my favorite restaurant. Ever. 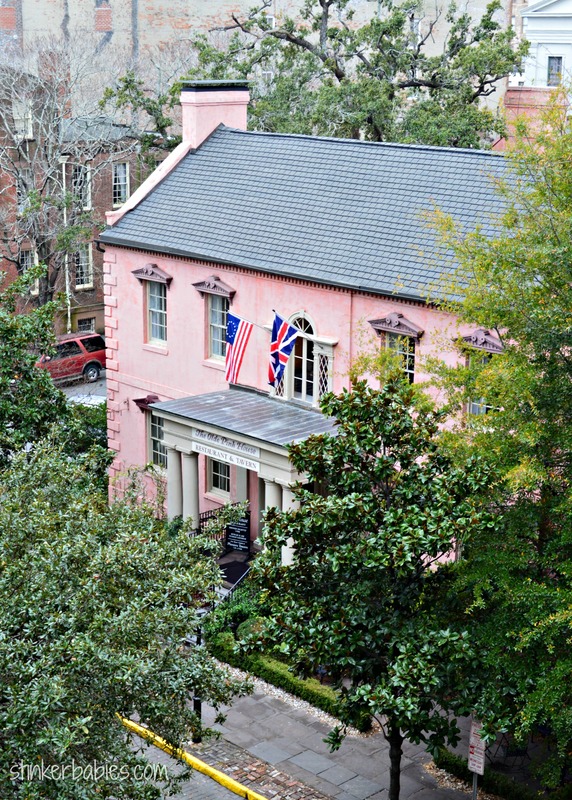 The Olde Pink House is literally just that- an old pink house. It was built in 1771 and was originally the governor’s mansion during colonial times. Each room in the house has been transformed into a separate dining room. We had a beautiful table for two in front of one of the fireplaces. The staff encourage you to wander about when you’re finished with your meal. Once you’ve explored the house, you’ll be able to request in which area you’d like be seated on your next visit. Jake and I decided we’d like to try the upstairs front room next time. It’s smaller and more cozy and intimate. The servers are very knowledgable about the history of the home and the menu is incredible. A very gourmet twist on Southern classics! If you go, save room for dessert! The house specialty was absolutely incredible. The Praline Basket is a homemade almond and pecan basket filled with vanilla bean ice cream, mango citrus sorbet, and seasonal fruit. Wherever you decide to dine, make reservations! Especially on weekends or holidays. Many places provide online reservation systems now so it’s super easy to get a table on the go. You do not want to be left out in the cold looking through the windows at all the delicious goodness. Do hit up Mrs. Wilkes’ Boarding House for lunch. We were incredibly disappointed that this was closed during our stay for renovations. I’m sure they’re back to normal by now, so here are the tips from the locals: Skip breakfast. Get in line by about 10:30 and you should make it in for the 11 a.m. sitting. Served family style, it’s been said that it’s like Granny’s house on Thanksgiving on steroids. Jake and I love music. We love to sing and we’re total goofballs. The most fun we had on the entire trip was at Savannah Smiles dueling piano bar. Swapping out every half hour, the performers are always fresh and energized. They are extremely talented, hilarious, and entertaining. With a little tip and a song title, you can have your requests played. With a little more money and a note on a napkin, you can have a message written on the big stage mirrors. At least until someone pays a bit more money to replace it. Savannah Smiles can get a little rowdy if there’s a special occasion and your grandmother might blush at some of the antics, but all in all is a great time! If you are the type that would be mortified by being called on stage and put in silly situations, do not let on that it’s your birthday, anniversary, or bachelorette party. If you enjoy that sort of thing, then by all means – VIDEO for blackmail material. If you like to sit, get there early. We arrived at about 10:30ish and there was not a seat to be had. They do have standing room in the bar area, but with coats and phones and wallets, it was WAY more comfortable once we found a table. I also just noticed they take reservations. That would have been good to know! Bring cash. It’s a $5 cover (I think) and unless you’re at a table, it’s a cash bar. Once you’re seated, you can start a tab with a debit or credit card. There are also some food options on the menu for snacks. The Most Important Tip of All: Pack a bag and GO! Get to Savannah ASAP. I’m already counting the days until we go back. Next > It’s a Girl! Meet Our Service Dog!